We print lots and lots of different kinds of banners including temporary barriers that you can quickly set up but then easily reposition if you need to for example as café barriers and mesh fencing banners. 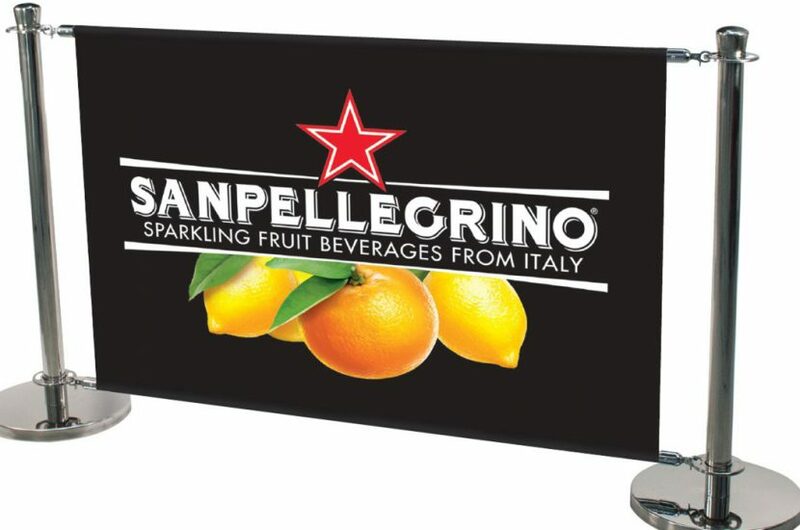 The Café barriers, or café banners, we supply come as complete outdoor display systems. Your design is printed onto highly quality, weather resistant PVC which is folded and stitched along the top edge so poles can be inserted. The horizontal poles are then attached to weighted, free-standing upright posts. If you are looking for pavement signs with additional wind resistance we can make your banners using mesh PVC and supply you with supporting posts fitted with heavier weights. For larger scale temporary outdoor advertising you might want to consider Heras fencing banners. These are larger mesh banners that are fitted to metal Heras fence frames. They are often used around the perimeter of construction sites or at outdoor events such as pop concerts and agricultural shows. Printed fencing is available up to 2m and can be linked to create advertising graphics of any length. Both café barriers and fencing banners have two major advantages; they can easily be moved and can be used again and again. Be sure to check out the location of your barriers very carefully. Exactly how much room do you have and what sort of weather will they be exposed too? Once you have your measurements and a good understanding of the location, we can help you choose the best materials. That’s not just the banner material but the best type of frame too. We offer a range of fixings, posts and frames for our café barrier mesh fencing banners but we don’t provide the Heras fencing systems themselves. Our banners can be hemmed for poles or eyeletted for bungies, cable ties and ropes.